An excellent crystal for rapidly shifting blocked energy. 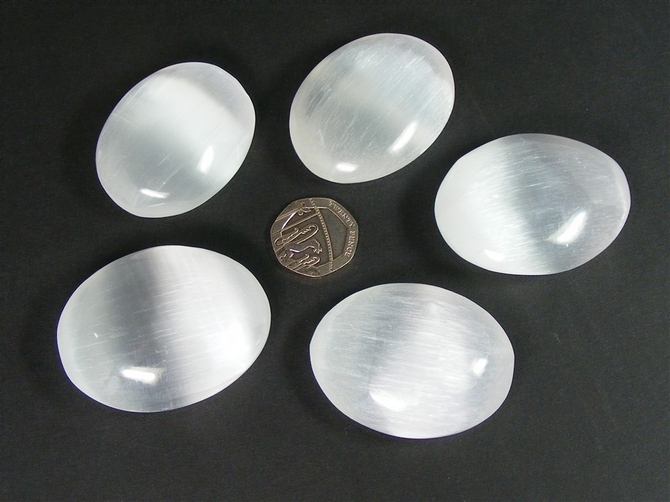 These super A Grade Selenite palm stones have everything you'd expect from quality Selenite, a lovely sheen, a great feel in the hand and a gorgeous semi-translucency. Really lovely palm stones ! Selenite helps with disorders of the nervous system and can also provide some help with epileptic disorders. It aligns the spinal column and increases overall flexibility. It helps with wrinkles and with age spots and is useful for those who suffer from light sensitivity. Selenite is best known for its ability to rapidly shift blocked energy, clear away negative energy and lessen, or remove, emotional turmoil and confusion. Selenite aids concentration and clear thinking, provides clarity of mind and strengthens your own decision making process. It can make you much more aware of things – on all levels - helps you to better understand situations around you and also helps you to reach the correct judgement in disputes. Selenite helps us to reach new states of consciousness. Meditating with Selenite can help to expand your sense of spirituality. Do not wash Selenite in water, it will dissolve if left in water for too long. Rough pieces MAY be OK to quickly dip and dry. However, cut, shaped and polished pieces should NEVER be washed as the polished finish will deteriorate rapidly.